Premium Indian Tonic die je gin-tonic naar een hoger niveau tilt! Aanrader! Tonic water, the classic pairing for gin, has a love/hate reputation. Our aim was to create a tonic water that rewarded the palate rather than shocking it, so we began by brightening the top of the quinine flavour with pink grapefruit and then we deepened the lower notes with a subtle hint of juniper berry to round out the angularity of quinine and lengthen the finish of the tonic, reducing the bitter after-taste to which many people object. 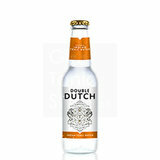 Super zachte tonic voor wie niet van de bittere naschok houdt.